It’s that time again! Bout of Books time, of course! So, the idea is that you read what you normally read, and maybe participate in some challenges, giveaways and grand prizes. Woot! I even tweeted about Bout of Books! Feel free to join and have some awesome reads, with a great group of people! I plan on reading at least five books and reviewing them–if not more. Crossing my fingers! 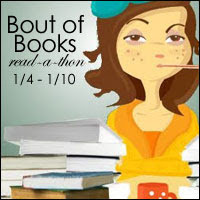 Are you doing bout of books? If so, comment with your goals!